Have any questions? Feel free to ask here! A: Please use the General Discussion forum for socializing, and other non-Lego related topics. Q: How do you post pictures? A: If you have the image URL, then just post it using the "Insert Image" icon in the toolbar. If the picture is from Flickr, click the arrow under the pic, pick BBCode from the drop down menu, and pick Medium for size. Then copy the text in the bar and paste in on the new post page after selecting the BBCode button on the bottom left, and your picture should show up. Q: Can I post pics of my non-sci-fi builds here? A: The Medieval and Miscellaneous forums are for any build not Scy-Fi related. Q: I registered, but I wanted my name to be, "Spaceman Benny", and I could only register as "spacemanbenny". Can do I fix it? A: Go to Profile > Edit Profile > Personal. From there, you can edit your display name (the name everyone sees on your posts). You will still use your register name of "spacemanbenny" to log in, but you can make it appear as "Spaceman Benny" on your profile. Q: Are there rules about posts (For example, double posting, etc.)? A: Just use common sense. Posting a response to someone's comment, then posting again to respond to a different part of a thread is fine. Posting over and over again to increase your post count, to bury someone else's post, or to dominate a thread is not allowed. 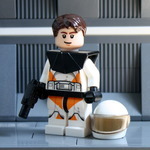 Q: Can I post leaked images of unannounced LEGO sets on Galactic-Bricks forums? A: No. We strive to be good members of the LEGO community, and to have a good relationship with The LEGO Group. Please do not post unauthorized pictures. Last Edit: Oct 16, 2014 18:45:14 GMT -5 by lego3364!